Abstract: Based on the 925X chipset, the Gigabyte GA-8ANXP-D supports the new Socket 775 Intel Pentium 4 processor formfactor. When Intel released its Socket 775 Intel Pentium 4 processor in June, it changed the face of computing as we know it. Not once in recent history has a single manufacturer attempted to push so much technological change onto consumers with a single pass. For along with the Socket 775 Intel processor comes new memory, a new videocard and expansion card interface, new power supply requirements, and new cooling devices. If we look back to recent changes in computing, most major changes have been introduced incrementally, over a longer period of time. 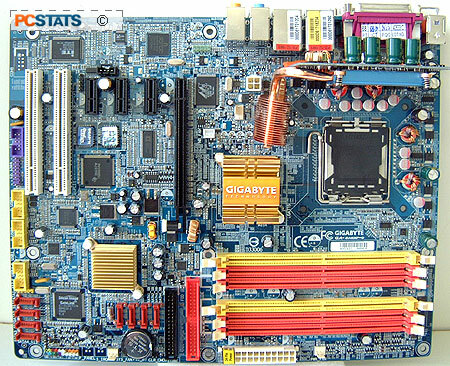 In this review, PCstats.com is testing out Gigabyte's new Intel Pentium 4 flagship motherboard, the GA-8ANXP-D. Based on the 925X chipset, the Gigabyte GA-8ANXP-D supports the new Socket 775 Intel Pentium 4 processor formfactor, and can be run with up to 4GB of DDR-2 memory. 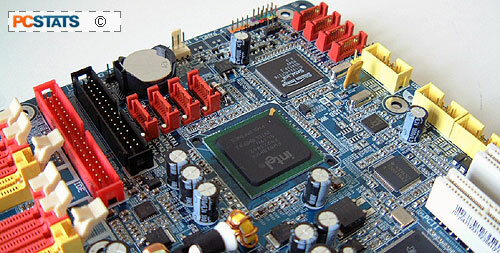 This is a fully loaded ATX motherboard, with PCI Express videocard and peripheral support. The GA-8ANXP-D includes a grand total of eight Serial ATA headers (four from the Intel ICH6R Southbridge, and four from a Silicon Image controller), IEEE 1394b Firewire, one PCI Express Broadcom 5751 Gigabit NIC and one Marvel 8001 PCI Gigabit NIC, a PCI 802.11g wireless card, 7.1 channel Intel 'High Definition Audio' and dual BIOS'. It also has its very own heatpipe cooled 8-phase power supply, which we'll get to in a moment. Oh, and it's bundled with Norton Internet Security 2004. A nice touch, that. 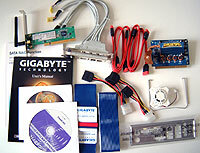 ;-) Gigabyte include so much with this board that it the box is comprised of two full size motherboard pizza boxes! And yet, because the GA-8ANXP-D is based on the 925X chipset, there is only one, ONE! IDE channel. Shocking, perhaps... but, with all those Serial ATA headers Gigabyte are clearly positioning the GA-8ANXP-D for higher end workstations, and enthusiats. The 925X chipset still supports FDD devices, but I wouldn't expect that to last long now that IDE devices are being relegated to the history books. Best to plan on upgrading to all Serial ATA compliant hard drives with this board, and leave that IDE channel for the optical drives. Looking over the GA-8ANXP-D itself, we find two legacy PCI slots, three PCI Express x1 slots, and one PCI Express x16 slot for graphics adaptors. The board makes good used of colour coordinated ports and sockets to help novice users when they install components too. Additionally, adequate labelling on the PCB identifies which headers are for what, so users needn't reference the manual too much. It even has a little sticker on top of the NIC ports indicating the MAC address of the card. That information comes in handy if you are applying MAC address filtering on your firewalls. Pg 12. There's so much motherboard!! !